Obama’s Policy Directive on Cuba: Changing the Status Quo? On October 14th, President Obama utilized his executive powers to issue a new directive on the United States’ relationship with Cuba. The directive dictates new rules that cover a wide range of areas, from supporting medical-related business projects to reinstating normal limits on importing Cuban products for personal use. It also widens the field of grants, scholarships and awards that can be provided to Cuba or to Cuban citizens, which will now include scientific research and religious activities (Chappell 2016). Why were these new provisions passed by the Obama administration? In the directive, Obama states that the initiative stems from his initial 2014 plans to end an outdated policy towards Cuba that had failed to advance U.S. interests and support reform and a better life for the Cuban people over several decades. The objective of this new policy is to help the Cuban people to achieve a better future for themselves and to encourage the development of a partner in the region capable of working with the United States to confront regional challenges (Office of Press Secretary 2016). However, because Congress has still been unable to lift the trade embargo, these new mandates are trying to develop new relations in spite of the major blocks to trade between the two countries. So, why does this directive matter? allows U.S. companies to negotiate binding contracts in Cuba, even in areas currently prohibited under the embargo. lifts $400 monetary limit on the amount of Cuban products Americans can bring back in their luggage for personal use. lifts restriction that travelers can come back with only a combined total of $100 of alcohol and tobacco products. They can pack as many bottles of Cuban rum and cigars in their bags as they like — as long as they are for personal use and they pay the duties and taxes that would normally apply. allows online sales of consumer goods to Cubans without requiring U.S. companies to get a prior license - “Any type of consumer goods you could think of” from toothpaste to air conditioners, television sets and auto parts. lifts a restriction that prohibited foreign ships from entering a U.S. port to load or unload cargo for a period of 180 days after calling on a Cuban port. Cubans will be able to receive grants not only for traditional educational and humanitarian purposes but also to pursue scientific research and religious activities. allows U.S. nationals to provide services to Cuba or Cuban nationals related to developing, repairing, maintaining and enhancing Cuban infrastructure. This directive is also significant because it will be hard to overturn. According to Obama, this directive “takes a comprehensive and whole-of-government approach to promote engagement with the Cuban government and people, and make our opening to Cuba irreversible” (2016). The new regulations are affecting American business and scholarly practices with Cuba, which will be hard to scratch in light of American interests. Still, many Republicans have voiced concern over Obama’s new directive, including presidential nominee Donald Trump, who tweeted that he would “reverse Obama's executive orders and concessions towards Cuba until freedoms are restored” (Whitefield, 2016). Many see Cuba’s repressive government as an inhibitor to trade until the country becomes more democratic. Why is this initiative of the Obama administration happening now? Some see it as Obama trying to solidify his legacy of beginning the normalization of U.S. - Cuban relations, and so he is initiating new policies before the end of his term. Others see it as a solidification of previous efforts to ease restrictions on travel and commerce with Cuba. Most importantly, how do Cubans in the government and society perceive this new directive? Many are expressing frustration. The government showed its discontent during a series of protests across the island that paralyzed universities and other schools under the slogan “Hornet’s nests against the blockade,” a reference to the trade embargo (Torres, 2016). This is because these new policies are hard for Cuba to initiate due to the longstanding barriers still in place. So, until the embargo is lifted, the directive won’t have much effect. Josefina Vidal, head of the U.S. department of the Cuban Foreign Ministry, noted how the initiatives are “positive”, but benefit “the United States more than Cuba and the Cuban people” (Torres, 2016). Many American companies agree with Vidal in that until the embargo is lifted, the de facto state of commerce and business cooperation between the two countries will be miniscule. So, the directive changes the situation, but in some ways will not affect the status quo very much. Depending on the outcomes of this election season on November 8th, the United States’ status with Cuba could remain very much the same or change radically. 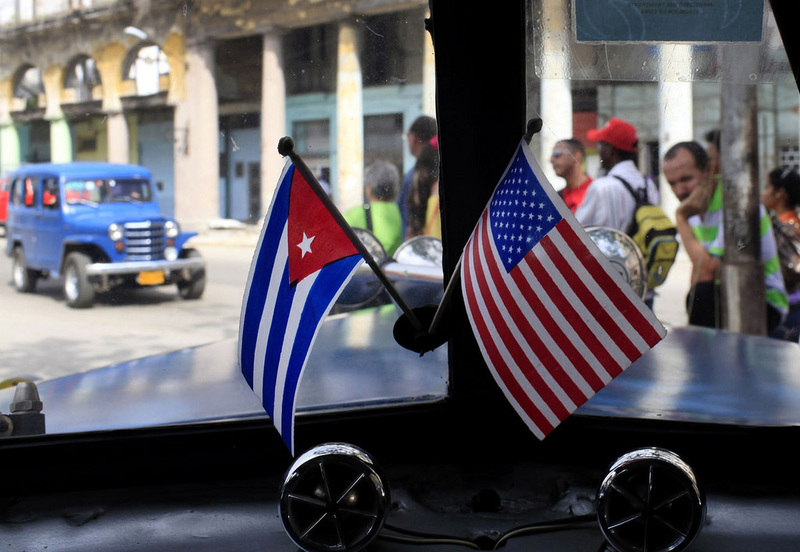 Even with all of the pressing issues being discussed with a new president and new balance of Republicans and Democrats in Congress, U.S.- Cuban relations are still important, and could have a huge impact on both countries if the embargo is lifted. Daniel Snyder is a senior at the University of Pittsburgh working as a Panoramas intern. He is studying Economics and Spanish, as well as earning a minor in Portuguese and a certificate in Latin American studies. During the summer of 2016 he conducted research in Fortaleza, Brazil through the CLAS Field Trip and also studied abroad in Lima, Peru.